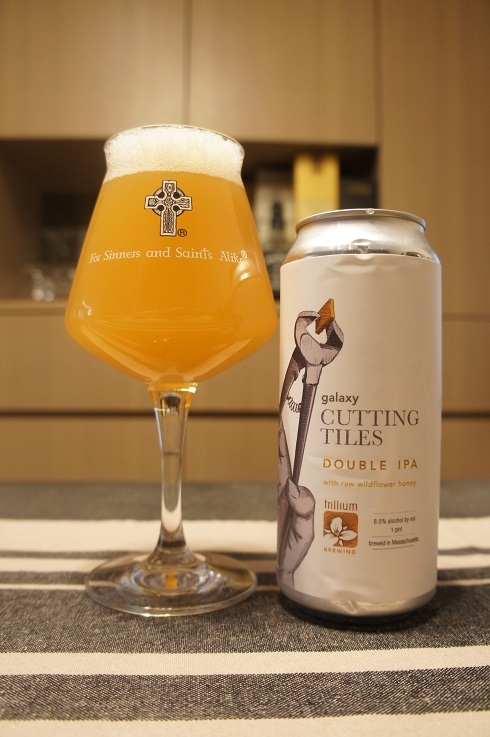 Brewer Description: (from website) Cutting Tiles is an exploratory series of Double IPA’s featuring a range of aromatic single hop varietals brewed with raw wildflower honey. This version is dosed with 100% Mosaic in all kettle, whirlpool and two massive dry hop additions. The local wildflower honey keeps the body light and drinkable but provides a floral, earthy backbone. Juicy, candied peach and nectarine up front backed up with a nuanced white wine character on the nose that continues straight through in the flavor profile. Pillowy soft mouthfeel, with a restrained bitterness on the finish. Initially, Mosaic Cutting Tiles was called Artaic. We enjoyed the beer so much that we wanted to experiment with different signature hops (i.e. 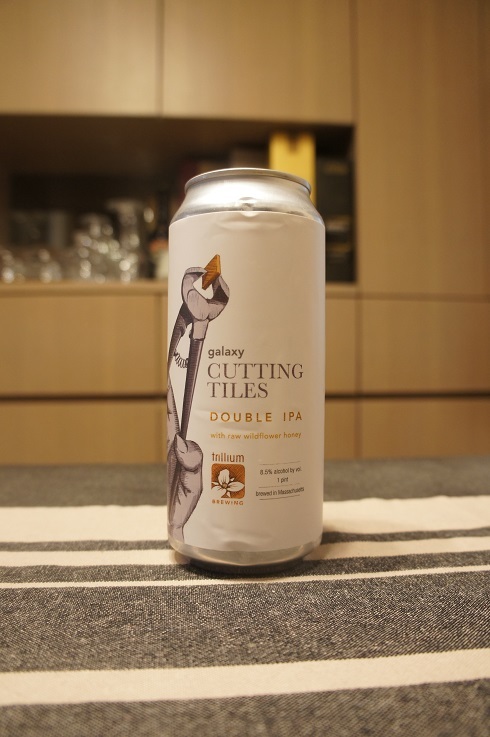 Galaxy, Citra) with the base beer. 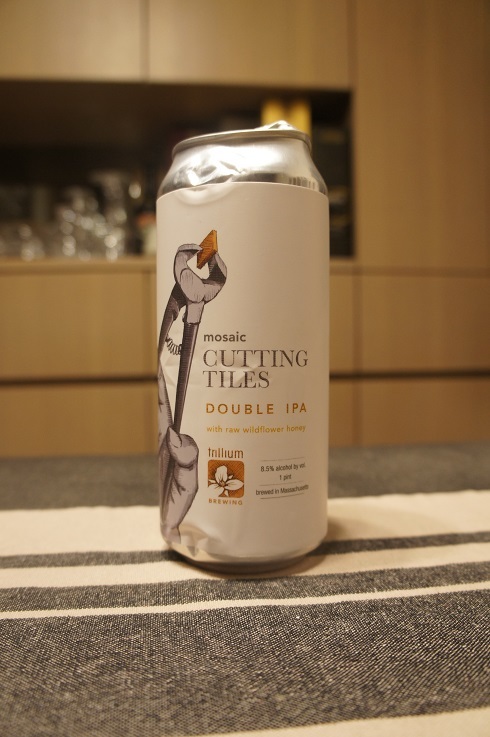 We felt the name “Artaic” would lead to confusion as it sounds so similar to “Mosaic”, so we renamed the beer to Cutting Tiles as a nod to the original name (honoring an innovative business in Fort Point that uses robotics to create dynamic tile mosaics). The same recipe for Artaic is what we use now for Mosaic Cutting Tiles. Intro: A 1 pint can, with strangely no visible canned on date (looks like it got cut off the side of the can). Can was also quite severely deformed on the top (my fault), which made it extremely hard to open, although I somehow managed it in the end. Doesn’t appear to have affected the beer with no leaks. Poured into a Lost Abbey teku glass. Appearance: A hazy dark orange colour with a half finger white head that dissipated quickly and left only sparse lacing. Aroma: Orange, mango and pineapple with a hint of grass, caramel malt and booze. Taste: Grapefruit and citrus rind light bitterness, with some pineapple, honey and malt sweetness. Overall: This was nice, but sweeter and maltier than expected, and just didn’t feel as balanced as the Galaxy version. Brewer Description: Not yet posted on website. Appearance: A hazy dark yellow orange colour with a one finger white head that dissipated fairly quickly and left only sparse lacing. Aroma: Orange, mango, peach and pineapple with hints of honey. Taste: Pretty much follows the aroma with mango, peach, pineapple, orange rind, grapefruit and light floral notes. Good balance of light sweetness and light bitterness. Mouthfeel: Creamy, medium to full bodied with moderate lively carbonation. 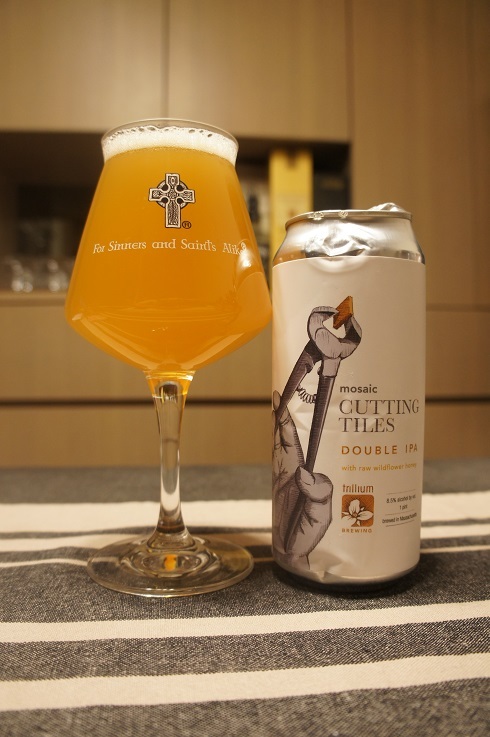 Overall: An excellent DIPA with a good balance of sweet and bitter and nice tropical and citrus fruit, aroma and taste. 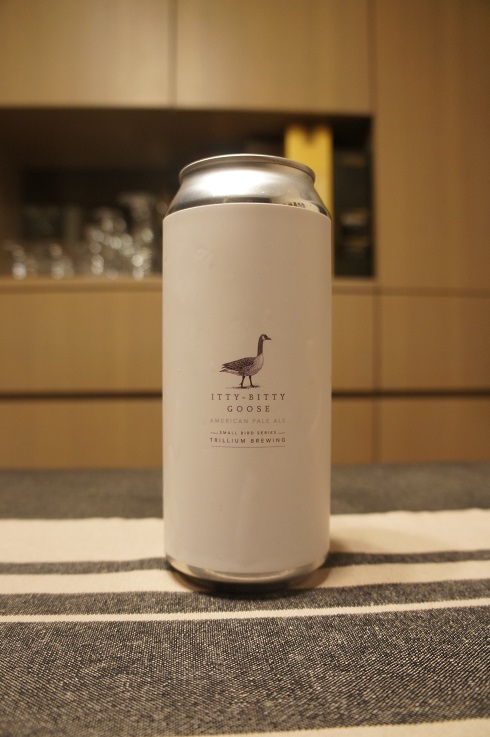 Brewer Description: (from website) A refreshingly hoppy American pale ale, Itty Bitty Goose is another edition in our “Small Bird Series” of lower ABV pale ales. The nose is an ripe apricot, lemon, and lightly toasted malt. Citrus peel and grassy hop flavors fill the palate and ends in a soft yet crisp mouthfeel. Dry and effervescent, light to medium bodied. Intro: A 1 pint can, canned on 24th July 2017. Poured into a Lost Abbey teku glass. 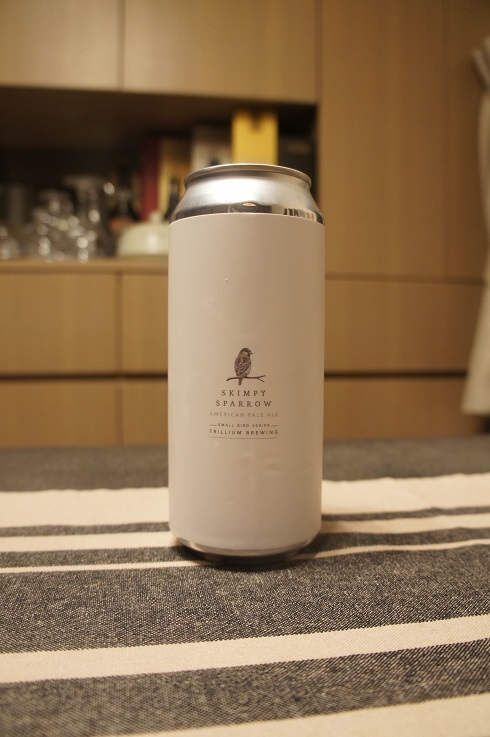 Brewer Description: (from website) An easy drinking hoppy American pale ale, Skimpy Sparrow is another edition in our “Small Bird Series” of lower ABV offerings brewed for the summer. The nose is an intense, complex fusion of pineapple, grapefruit pith, and woodsy hop aromatics. Citrus rind, grape jam, and lemon fill out the flavor profile, with a firm and long-lasting bitterness. Very dry and effervescent, light to medium bodied. Intro: A 1 pint can, canned on 11th July 2017. Poured into a Lost Abbey teku glass. 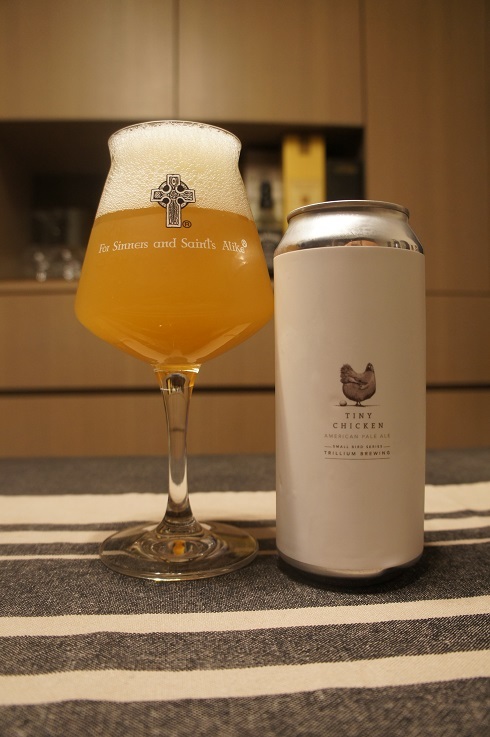 Appearance: A hazy dark yellow orange colour with an almost two finger large frothy bubbled white head that had decent retention while leaving some lacing. Aroma: Orange juice is quite strong, with grapefruit, mango, peach and pineapple in the background. Taste: Mild bitterness, peach, mango, pineapple with hints of orange, citrus rind and bready malt. Mouthfeel: Dry, crisp-ish, light bodied with moderate carbonation. Overall: Something about the aroma makes me enjoy the taste more than the aroma. But still refreshing and easy to drink. Tasted side by side with Lights On. Preferred the aroma of Lights On, but Skimpy Sparrow tasted better. 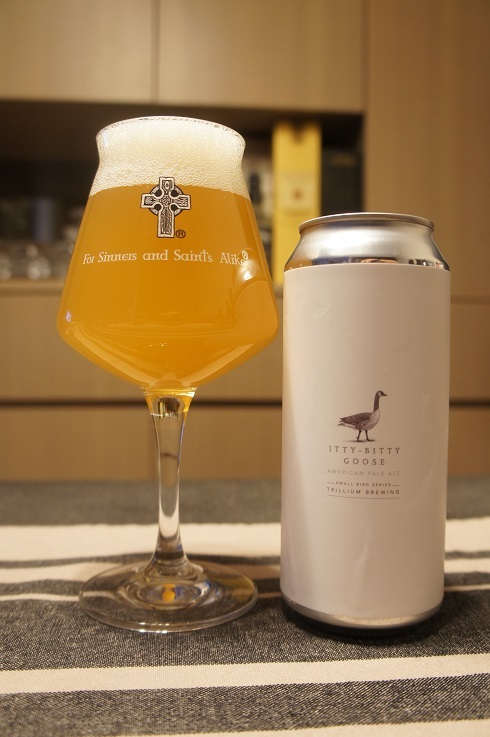 Brewer Description: (from website) With the New England summer fast approaching we release Tiny Chicken, another edition in our Small Bird Series of lower ABV, hazy pale ales. Deceivingly diminutive in name, Tiny Chicken packs a hoppy punch with a powerful combination of Galaxy and Amarillo. Engaging aromatics pop with notes of bright citrus and peach, while flavors of tropical fruit, melon, and orange sweep over the palate in refreshing waves. Finishing crisp and dry with slight earthy/spicy grain character from the use of locally malted wheat and Danko rye. Intro: A 1 pint can, canned on 1st June 2017. Poured into a Lost Abbey teku glass. Appearance: A cloudy hazy orange colour with a big two finger soapy white head that dissipated fairly quickly and left only sparse lacing. Aroma: Citrus and juicy grapefruit, fresh squeezed orange juice and orange zest. Taste: Very juicy citrus with grapefruit, mandarin and orange, some grape and honeydew melon, with hints of tropical mango and peach on the finish. Mouthfeel: Light to medium bodied with moderate carbonation and a hint of dryness. Overall: A very nice and juicy, easy to drink Pale Ale. Perfect for a hot summer day.